For the final day of our Siren Snow Release Party, we have a very special treat. Anyone who leaves a comment will be entered into a drawing to receive a free PDF copy of the book from the author. 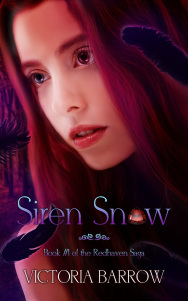 So, please enjoy reading my review of Siren Snow and don't forget to leave a comment! My Review: Siren Snow is the story of Lucy Sinclair, the young Witch-Warden for Washington State. She spends most of her days working in her shop and taking care of the routine magical needs of the folks under her care. Until a strange storm brings more than just a blizzard. A sea creature from the depths of the sea is just the beginning of Lucy’s troubles. When an injured siren washes up on shore, Lucy must embark upon a dangerous journey to save her. I’m waiting anxiously for the next book in the series and once you read it, you will too. I highly recommend this book. Leave a comment for a chance to win a PDF of the book! Great review, Tricia, and I love the book cover too. I'd certainly pick it up! The author has generously asked me to forward a PDF copy to the three people who left a comment. Looks like you're all winners! Thanks everyone for participating.